(FNA) – A Turkish dissident leader revealed that the pharmaceutical companies affiliated to Recep Tayyip Erdogan’s government have provided the terrorists in Syria with Sarin gas, reiterating that Ankara has been directly involved in Khan Sheikhoun chemical attack. In relevant remarks on Saturday, Syrian President Bashar al-Assad said Damascus is 100% certain that terrorists get chemical weapons directly from Turkey. “Directly from Turkey, and there was evidence regarding this, some of [it has] been shown on the internet a few years ago. You had many parties and parliament members in Turkey who questioned the government regarding those allegations. So, it’s not something hidden,” Assad told Sputnik. He further maintained that financial, armament and logistic support for terrorists in Syria, including recruitment, is provided through Turkey. “They don’t have any other way to come from the North. So, it’s a hundred percent Turkey,” Assad underlined. 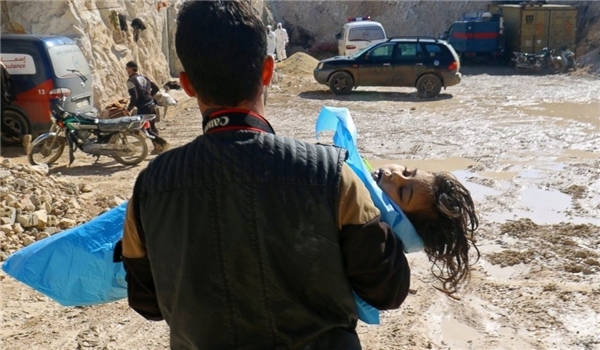 On April 4, the National Coalition for Syrian Revolutionary and Opposition Forces claimed that 80 people were killed and 200 injured in a suspected chemical attack in Khan Sheikhoun, putting the blame on the Syrian government. Damascus vehemently rejected the accusations and said militants and their allies were responsible. According to the Russian Defense Ministry, the Syrian Air Force hit a warehouse where militants stored chemical weapons, which were sent to Iraq. The Russian Foreign Ministry reminded that the Syrian government doesn’t possess chemical weapons since mid-2014. Chemical weapons have been taken out of the country with the US help. In response to the Khan Sheikhoun incident the United States launched 59 Tomahawk cruise missiles at the Syrian military airfield in Shayrat in Homs province.